Students packed the Patriot Center to welcome their basketball teams back to the court during Friday night’s Mason Madness. Photo By Jake McLernon. 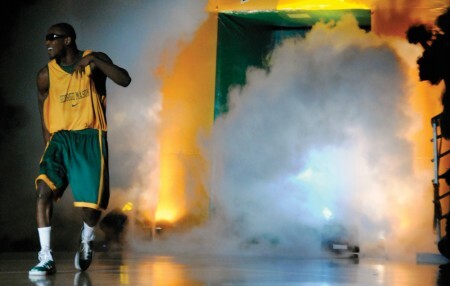 Following the introduction of every other member of the men’s and women’s basketball teams, senior guard Cam Long emerged from the smoke-filled tunnel for his final Mason Madness event. Long, who is on pace to finish his career among Mason’s all-time leaders in points, rebounds, assists and 3-pointers, took on a significant challenge last season as he captained an extremely young basketball team. Long, like the rest of the players, got an opportunity to showcase their talent and give the George Mason student body a chance to get a taste of what may be to come this season at Friday’s event. Following performances by Peter Rabbit, the legendary bucket drummer from New York City, Urbanknowlogy 101, the Masonettes, Mason Cheerleaders and Doc Nix and the Green Machine, Long and his teammates put on a show for Mason fans. “It’s a great turnout like it always is. The crowd is always there. That’s one thing I love about this school. The fans are just amazing and I give them all the love in the world. Regardless of whether we’re losing or winning, the fans are always there showing us how much they love our team” Long said. Last year, you may remember, then-sophomores Ryan Pearson, Mike Morrison and Andre Cornelius competed as super heroes in the dunk competition. Looking to build on last year’s performance, the junior trio pulled high-flying sophomore Luke Hancock on to their team and performed as the JabbaWockeeZ, a popular dance crew who is known for wearing plain white masks and gloves in order to encourage audiences to focus on their movements instead of individual dancers. The group capped an impressive dunking performance with an alley-oop to the five feet-ten inch Cornelius, who finished with authority. His slam capped an exciting night for Mason basketball teams and sealed the third consecutive victory for the team of juniors. “This an evening for the students. And the students came out to cheer on other students. It’s all about developing a school spirit and the spirit here at George Mason continues to grow and get better every single year,” Larranaga said. With another year of familiarity under the Patriots’ belt, Long will be afforded the opportunity to relax and let his more experienced teammates help him to reach the team’s ultimate goal this season: a Colonial Athletic Association conference championship and a berth to this year’s NCAA Tournament. “My main thing this year is to not be so hard on myself. I think you’re going to see a person this season that’s got a lot more smiles, a lot more motivation and somebody who shows a lot more emotion as well,” Long said.